Plumbed Down: No Easter Service? What's an Uncommitted Pew Sitter To Do? No Easter Service? What's an Uncommitted Pew Sitter To Do? I rose from the grave bed yesterday and realized that all my Easter day plans had fallen through. Our somewhat-attended church is feeding the homeless, (a very Christ-like, but not traditional, Sunday experience) and well, it just feels odd. I have the utmost respect for those that go out into the dark underbellies of our cities to nourish the souls of the forgotten flock: those so far outside normal society that we pretend don't exists so we can sleep well at night. Yet, noble as the act is, it isn't unlike what I deal with at a low income school on an everyday basis; and it isn't exactly what I want for my little daughters who haven't really experienced the traditions of Easter, yet. Mostly, this didn't matter because a week earlier my mother asked if I would help her lead worship at a different church that we have connections to from years ago. It sounded like fun. I don't get to play my guitar much anymore, and Easter usually packs the house; filling those normally sparse aisles with dragged-in agnostic spouses, and Tom Sawyer-ish children who may only experience "church" two or three times a year. Long story short, the worship gig fell through as well, leaving me with nowhere to go for Easter. Only G.O.T. fans will get this. 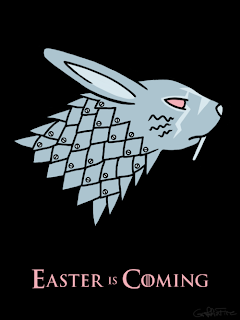 Which means the only thing on my Sunday agenda is the Game of Thrones season 3 premiere on HBO; a wholly unholy event that I have been hedonistically looking forward to. I'm not judging myself for wanting to see the show, it just feels unjustified now that my uplifting spiritual aspect of the day is no longer possible. (It IS weird timing on HBO's part). And even though I don't really believe in the religious idea of GUILT, I did feel like a balancing of message immersion was necessary. So rather than attend a random church that we would probably never visit again, I decided to have church at home, which isn't so strange historically, but feels odd in today's times. Hundreds of churches would gladly accept my family as visitors, but I'm not good at being a spectator. I believe in a body of believers, where every person has a calling in the flock, not just the pastor, worship leader, and the guy who gets to hand out the offering plates, but actual spiritual roles in the church. This organic model of church is more difficult and messier than the big-box business approach to church building with its top down leadership roles. I think modeling churches after business is what is driving people away from churches. They can sense the inauthenticity before they taste their bland communion wafers (Jesus would never taste like stale rice cakes). Needless to say, I have a few opinions on churches, so I make for a terrible "visitor." But I'm also not a good spiritual self-regulator. I don't pray much, often forgetting for weeks at a time how important it is to my well-being. I don't read the Bible much, either. I'm not ignorant of the Bible, though--I can quote a few scriptures here and there, and know the general idea of most books of the Bible, but I'm no scholar. Being frank, though, most people don't need a scholar. And while I cringe when somebody makes a political absolute on the thinnest Biblical theology, I believe that the majority of people who call themselves "believers," do so because of a spiritual experience, and not because of "sound doctrine." While I think it is important for a church to be founded and practice Biblical principles, the majority of people who are looking for a church, are wanting real spiritual experiences--with real people. (Not necessarily like-minded, but authentic people). In summation--church shouldn't be phony. If the church is going to be viable in this century, it has to give up the stupid top down leadership role, and allow messy, sinful, diverse, and odd members to not just be pew sitters, but active participants in the church. Jesus pulled his disciples and followers from the lowest rungs of society and made them Earth shakers. 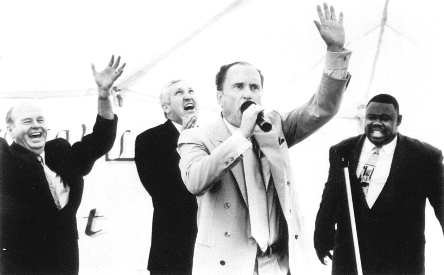 The world needs Earth shakers, and not the kind who wear $600 suits, went to the top seminary school, and dream of buying a wireless microphone that will never feedback...no, the next generation of "seekers" will not buy into the whitewashed appearance of churches of the past. These college educated masses have become so jaded and skeptical and misinformed and literal and untrusting and sensitive to any message, that if it doesn't sound authentic, or include an unfathomable spiritual experience, they will walk out the door and never return. 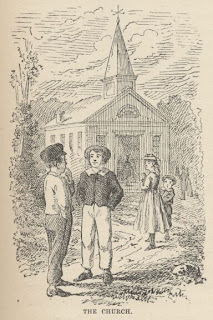 And some, desperate for reverence, might end up having church in their home like it was 1876: living in a homestead On the Banks of Plum Creek. Besides having to wake up early and go to two services on Easter (sunrise and traditional), I do remember really loving the Easter service. Like Christmas, they were always more special. While it's great that your church is feeding the homeless, I'm with you; I'd want a full fledged Easter service this Sunday. I'm sure you're going to have an awesome home service though. Maybe you'll have some friends or family that might want to join you and help further create that sense of community that you were talking about. Honestly, that's the large majority of the reason I kept going to church in college; the relationships I fostered with the people in my church, and the way I felt a PART of the church, not merely an observer. Though there is a denomination of my church where I currently live, I don't get those same feelings there as I did when I lived in La Verne. Interestingly enough, I attended the current nearby church as a teenager, and even got baptized there, but so much has changed, and so many people have moved on that it's just not the same. Home church might be the way to go for me too. It's sad when a church from your youth is completely different. It's like going back to an old school and finding that they tore it down and built a fancier school with none of the old faculty. It's funny how important a building is to our personal faith. I find my faith without a body of believers is sorely lacking. I guess I haven't reached perfection yet.